Once again Fauquier became the 4A State Runner up. The Falcons had the following state placements: 160 lb Sam Fisher and 170 lb Franco Camarca earning 1st place, 126 lb Ethan Jordon, 132 lb Kyle Budd, 145 lb Joe DelGallo taking the silver, as 220 Tyler Raymond - 4th place as 120 Gino Camarca and 170 lb Kevin McEachin both taking 5th placemedals. Sam Fisher and Franco Camarca both become a 2X State Champion. The wrestling team closed the season with an 18-8 season record while winning the District Championships for the 13X. In 2017 Fauquier claims one of the tops spots in the VHSL 2017 4A State by earning Runner-up status. The Falcons had the following state placements: 160 lb Sam Fisher and 170 lb Franco Camarca earning 1st place, 120 lb Kyle Budd and 145 lb Tyler Foster taking the silver, as 132 lb Joe DelGallo placing 4th, and 138 lb Cam Franklin and 195 lb Jackson McEachin earning 6th place medals. Sam Fisher is the first Fauquier wrestler to win the State Champion as a freshmen in Fauquier County history. The wrestling team closed the season with an 9-12 team record while winning the Regions for the seventh time over the past eight years. In 2016 Fauquier claimed the VHSL 2016 4A State Team Champion title. The Falcons had the following state placements: 113 lb Kyle Budd and 160 lb Garrett Tingen earning 1st place, 138 lb Kyle Roche and 170 lb Clifford Harrison taking the silver, as 126 lb Ty Foster and 145 lb Caleb Strum brought home third place medals. Garrett Tingen is the first Fauquier wrestler to win three wrestling State Champion in Fauquier County history. The wrestling team closed the season with an 18-4 team record while winning the Conference 22 ten times over the past eleven years and again winning the Region Champions for the sixth time in seven years. Shifting multiple times between the AAA and AA classifications Fauquier now rest in 4A, yet Fauquier has consistently produced multiple state champions and state finalists. The 2014 team had team Fauquier earning a 2nd place finish in the state meet and was the first time that the Falcons had 3 wrestlers win states in one year. In most recent years the Falcons have placed 3rd in AAA states in 2008, 2nd in AAA states in 2009, 3rd in AA states in 2010, 5th in AA states in 2011 and 2012. Over the past 15 years the Fauquier Wrestling team has emerged as one of the top teams in the state of Virginia. 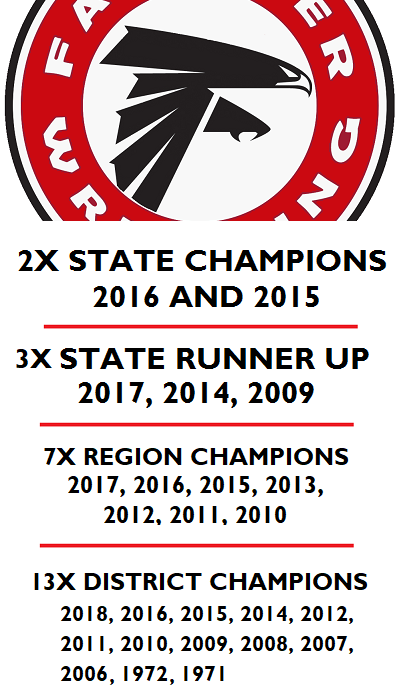 Year in and year out the Fauquier wrestling team has traveled to the best tournaments on the east coast such as: Beast of the East, Mount Mat Madness, the Virginia Duals, USMC Challenge and Super 32. In 2013-14 Virginia – VHSL effectively realigned high schools into the six different classifications from a three A classifications. Then again as we start the 2015-16 school year Fauquier currently rest within Conference 22 and is Classification is the 4A West Region. The following are the current high schools that are within Northwestern District.